It’s that time of year in the Midwest. The hours of daylight are shrinking, temperatures are dropping, and the the days are grayer and grayer. Our evolutionary drives tell us to start eating lots of carbs and to move slowly. We get a bit growly. We walk with our eyes to the ground, as if refusing to look Mother Nature in the face will stave off the onset of winter. And then the gray clouds part and the beautiful fall evening sunshine hits the moisture in the air and creates a full technicolor rainbow with, yes, it sounds too good to be true, a second paler rainbow above. People get out of their cars and stare at the sky. They point and chat with strangers also getting out of their cars. 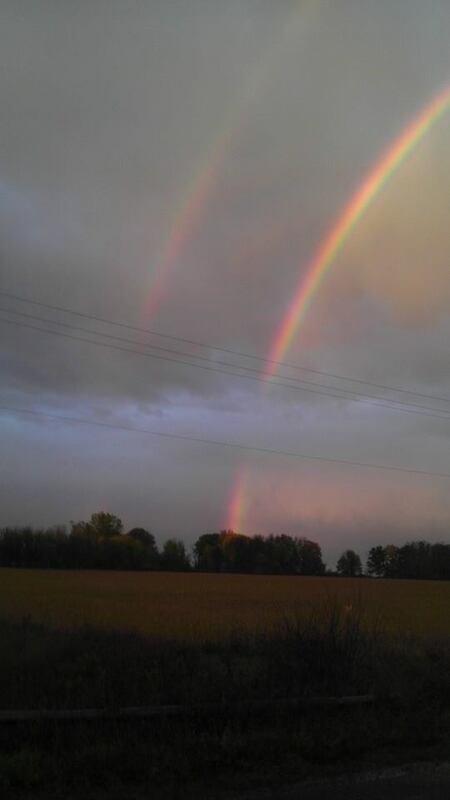 They stand and talk while they watch this magnificent double rainbow, certain it will not last long. People emerge from buildings, grim looks on their faces, but, rainbow spotted, they stop in their tracks and smile. Cars slow. Cell phones snap photos even though the owners know no camera can grab the majesty of what they are seeing in the sky. We are a complex, technology-driven, overscheduled society. And yet, large groups of people stopped and stared at a rainbow. We are a society that would rather stare at our screens and converse with people we can’t see than those right in front of us. And yet, people reached out to strangers and held sustained conversations about sunlight hitting particles of water suspended in the air. We are a society of scientific explanations. And yet, knowing the science of the rainbow does not diminish the sense of wonder and mystery, that feeling that this rainbow bestows a blessing or is a sign of the bestowal of a blessing. It’s a sign and that implies a someone or something trying to communicate with us through signs. The rainbow lasted for nearly 30 minutes. Eventually people had to continue on their paths or get back in their cars, but they did so with lighter hearts. When their heads hit their pillows after the sun had set and the rainbow had disappeared, they dreamed of rainbows and a world in which there was light and hope and mystery.